Workshop on How to talk like TED? 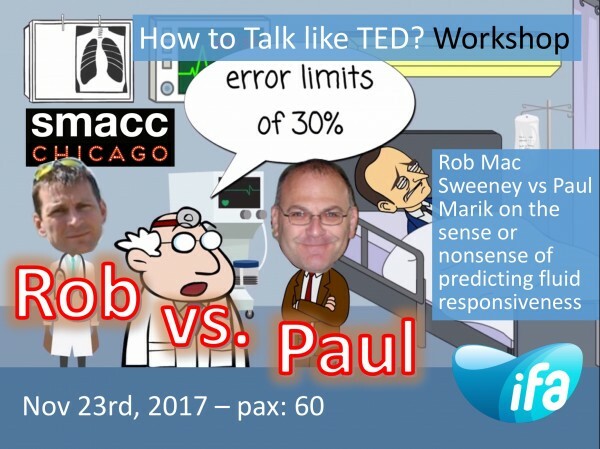 This workshop is based on the historical battle between Rob and Paul held at SMACC Chicago in 2015 entitled “Predicting Fluid Responsiveness is a Waste of Time”. For those who have missed it in 2015 here is your chance to relive history. You can watch the epic battle of 2015 here https://vimeo.com/204666563.Thanks to Scott Weingart (@emcrit) the audio of the podcast was matched with Rob’s (@critcarereviews) own videofile. SMACC_ MacSweeny vs. Marik - On Fluid Responsiveness-HD from Fluid Academy on Vimeo. TED stands for Technology, Education and Design. TED's early emphasis was technology and design, consistent with its Silicon Valley origins, but it has since broadened its focus to include talks on many scientific, cultural, and academic (medical, TEDmed) topics. Marik PE. Fluid Responsiveness and the Six Guiding Principles of Fluid Resuscitation. Crit Care Med. 2016 Oct;44(10):1920-2. PMID: 26571187 DOI: .